Explore French Riviera - take walking tours in Nice, France! 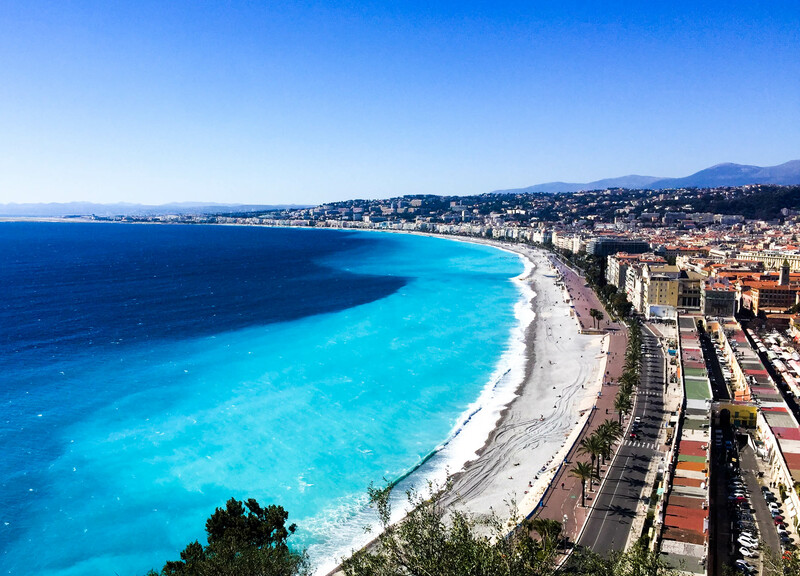 Explore French Riviera – take walking tours in Nice, France! Why should I go on the walking tour? When you find yourself in a new city, everything is new and exciting and you can’t get bored. Wandering around city streets and taking hundreds of photos of random buildings and sights is – for a tourist – definition of having fun. However, there is a very large possibility you will miss a lot of cool information when you depend solely on yourself and your smartphone. Especially if you don’t speak French – chances are that is the only language locals speak. In this article, you can find what makes our free walking tour in Nice, France unique. We start the tour at Place Massena – the main square in Nice – right in front of the Sun Fountain. There you will get more information about the square and its attractions. Later you will see the biggest sculpture in France, where you can get a brief history lesson about Nice. Afterwards, we go on to the Cours Saleya, a famous flower market in Nice. After that, we are taking a stroll through the narrow streets in the Old town. We stop on several locations to show some historically important buildings, some famous family business and to share some fascinating stories. We finish our tour on top of the Castle Hill, from where you have the best view on the whole Nice. On the flower market, we make a short 10-minute pause. There you can buy some souvenirs or try local Nicoise specialities. One of them is socca – gluten-free, vegan-friendly, or pissaladier – a small piece of pizza dough with caramelized onions, olives or anchovies on top. In addition, we take a group photo for memory on beautiful Promenade des Anglais (Walk of the English). Also, on top of the hill our guides give postcards and provide more information about anything and everything related to Nice or Cote d’Azur in general. For example, did you know that the airport in Nice is second busiest in France, only to Charles de Gaulle? Or that there’s a river flowing under the city? That first track of humans on this area go back to 400 000 BC? Or that there are more than 2000 restaurants in Nice?! No? You can find out that and much more if you partake in this walking tour. One thing is certain – you will have cool stories to tell your friends and family when you return home. Maybe you will tell them the story of the heroine of Nice, or about the most famous and charismatic French criminal. And I’m sure you will remember Sir Thomas Coventry and his wife. Taking an experienced local guide is one of the best things you can do in a new city. Firstly, you familiarize yourself with the culture and you get a sense of how the city ‘breathes’. You will learn about the history of the city and understand how it got changed over the centuries. Secondly, you get first-hand tips and tricks about what to do and where to eat. Moreover, you will get information about the prices of museums or bus tickets, which is great if you are staying for more days. And all of that you can get in a 2 – 2.5 hours! Regardless if you are travelling in a group or alone, are guides are making sure that there is always a friendly atmosphere. You can easily interact with the rest of the group, and – who knows – possibly make some friendships or future travel companions. This is a free walking tour, but if you enjoyed your time and you feel like you have learned something, a small tip will be much appreciated by our guides. It doesn’t matter if you are travelling alone or in a group. Anybody with a fresh set of legs and a basic understanding of the English language can join. It doesn’t matter if you are staying in Nice just for a few days. We organize tours every day except on Sundays – God’s and our day off. We meet in front of the Sun fountain on the main square in Nice – Place Massena at 10:50 a.m. and we start our tour at 11 a.m. Though, for your best interest, we recommend that you join us at the beginning of your trip. You will know what to do next and how to plan the rest of your trip accordingly. So, if this got you interested, perhaps you should think about taking a free walking tour in Nice. It is organized by Riviera Bar Crawl & Tours. Established in 2012, we are a local business with a successful history of making our clients informed and satisfied. We also make the best parties in Nice and organize a variety of different activities.